For the past three days Pen & Paint has been represented at Surtex by Jewel Branding. Surtex is the annual trade show for the surface design industry, and that means my artwork has the opportunity to be viewed by manufacturers and retailers around the world. I honestly can’t believe it! This is a dream come true. I opened my shop six years ago in May of 2009 as a hobby and creative outlet. I left the workplace to stay at home with my first child. I loved to create, and I started painting for friends and family. After three years of painting custom canvases and nursery art my work evolved, and in 2012 I began drawing and designing art prints. I changed my shop name to Pen & Paint and began a new adventure. The shop grew and I learned so many things. I finally felt like I was an artist and I knew it was what I wanted as a career. I was no longer a stay-at-home mama who painted and drew, but I became a work-at-home small business owner. Last year my husband and I realized it was time to take Pen & Paint full time. This meant my shop would become our main source of income, and my husband resigned from teaching to help take care of our children and assist with the business. This was the biggest, scariest thing we’ve ever done. What if the shop didn’t bring in enough income? What if I failed? I had dreams and plans, but the fear of the unknown was really hard for me. I had to constantly remind myself giving up wasn’t an option. One of my goals in taking Pen & Paint full time was to begin licensing my work. I had so many ideas and things I wanted to do with my artwork, but I was limited because I could not produce them on my own. I wanted the chance to create artwork for home décor, textiles, and so much more. I spent several months looking for an art agent to represent Pen & Paint. I knew I needed someone to handle the business side of licensing so I could focus on what I love – creating. I found Jewel Branding and knew it was the right fit. I was thrilled when they accepted me as one of their designers. Since January of this year I have been working to create patterns, greeting cards, wall art and other designs. 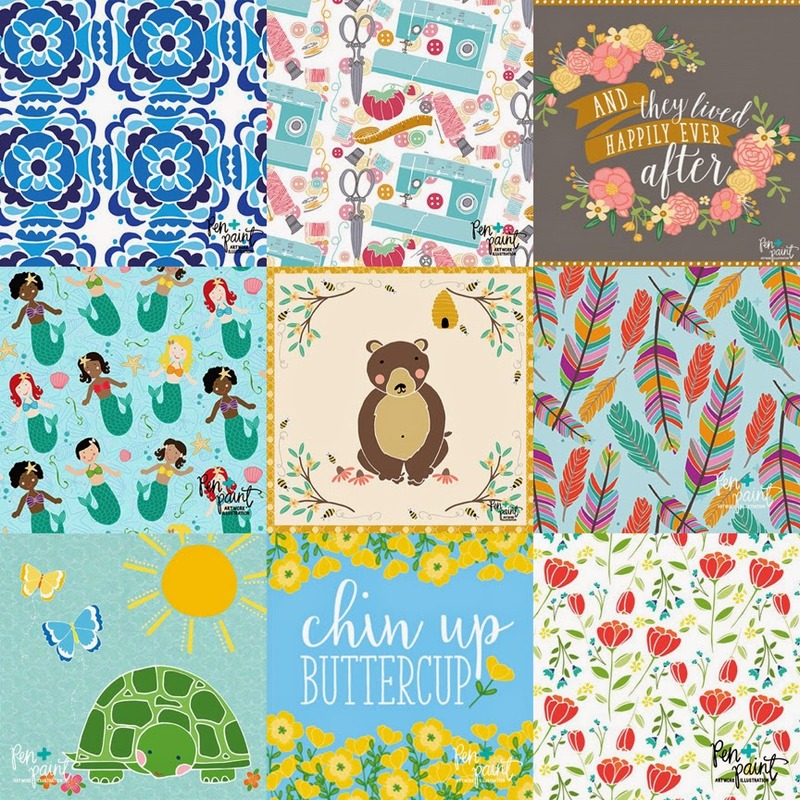 These designs and pieces of artwork can now be licensed with companies for products (meaning you’ll be able to find Pen & Paint on a variety of items sold in stores)! Some of my new designs you will see integrated into the art prints and stationery I sell in my shop as well. I still love running my Etsy shop and the opportunity to share my artwork on a handmade and personal level with my customers. My shop is what supports my family 100%. I am SO grateful for the support and encouragement I receive from my customers because without y’all none of this would be happening! I share all of this to encourage you to also dream big and make it happen. Whatever that thing is that you want to do, you can do it. There will always be fears and what if’s. There will be failures and setbacks. It will take time and patience and lots of work. It will be HARD and you will want to give up, but nothing worth doing is easy, right?